Jaipur is the capital city of Rajasthan and is also popularly known as the “Pink City” due to the distinctly colored buildings, which was painted in Pink to imitate the red sandstone architecture of ancient Mughal cities. Jaipur is located in the semi desert region of Rajasthan and is one of the most well planned cities in India. The three hill forts and several other Palaces in Rajasthan, takes us to the ancient rulers especially the Rajputs. 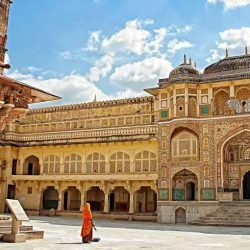 Jaipur was built in the 18th century by Sawai Jai Singh and is an integral part of the famous Golden Triangle Tour destination in India which includes cities such as Delhi and Agra apart from Jaipur.